ITAK Parliamentarian and President Counsel M.A. Sumanthiran, a proven ‘revisionist’ of Eezham Tamils’ external right of self-determination who sophisticatedly denies Tamil genocide, has now assailed former NPC Chief Minister Justice C.V. Wigneswaran, who mistakenly or deceptively ended up harping on IIGEP as a precedent-setting argument to justify the illogical demand for hybrid courts. After Sumanthiran's intervention, which was highlighted by Jaffna daily Kaalaik-Kathir on 31st March, Wigneswaran issued a new statement on the same day – this time in Tamil only – and said he was not asking to set up a group like the IIGEP. His initial statement also pointed out that the act of IIGEP dissolving itself was an example why an international investigation was necessary in the island, he reiterated. “The Hybrid Court could be constituted following the example of the International Independent Group of Eminent Persons (IIGEP) under the Chairmanship of Justice Bhagavathy” was the exact words Justice Wigneswaran used in a written statement issued in English on 29th March. He was emphasizing the call by projecting it as the lead paragraph in the statement. Justice Wigneswaran has the necessary political and legal knowledge and is capable of understanding the fact that transitional justice discourse doesn't work with genocide. Then, why is he playing with language and confusing the masses without bringing clarity to the masses he is supposed to lead, asked Tamil activists for alternative politics in Jaffna. Wigneswaran has come far in intelligently and timely challenging the detractors among Tamils throughout his tenure as the chief minister of the Northern Province. However, the former NPC CM needs to grasp the underlying legal and political paradigms of the entire UNHRC discourse and contribute wisely to chart a course without falling in the trap of legal and academic jargon of the international politics, commented Tamil activists for alternative politics in Jaffna. In this regard, Sumanthiran's latest intervention has created an opportunity, as a blessing in disguise, they said. The Jaffna-based daily Kaalaik-Kathir also needs to be appreciated in the same manner for giving such prominence to Sumanthiran's piece. The act of rationally confronting Sumanthiran should be scientific and logical in approach, and the narration must be addressing the paradigm set by international politics. Wigneswaran would do better by addressing the archers behind Sumanthiran rather than targeting the arrow with duplicity. The readers should also understand the good intentions of the former NPC chief minister, who was passing the responsibility to the countries that promoted the latest ‘Sri Lanka’ manoeuvre at the UN Human Rights system in Geneva. The 30 countries that backed the latest resolution were: Albania,* Australia, Austria, Belgium,* Bulgaria, Canada,* Croatia, Czechia, Denmark, Finland,* France,* Georgia,* Germany,* Greece,* Iceland, Ireland,* Italy, Luxembourg,* Malta,* Montenegro,* Netherlands,* New Zealand,* North Macedonia,* Norway,* Poland,* Romania,* San Marino,* Slovakia, Sweden,* United Kingdom of Great Britain and Northern Ireland (* State not a member of the Human Rights Council). Certain realities should be grasped by the Eezham Tamils, particularly their political leaders such as Justice C.V. Wigneswaran if they are serious about advancing their struggle for international justice. The key lies in understanding the origin of the post-May 2009 UNHRC/OHCHR discourse, i.e. understanding why and how the roadmap was conceived, launched, ‘influenced’ and ‘managed’. There is also the legal truth, which must be much easier for Justice Wigneswaran to grasp: ‘Transitional Justice does not work with genocide’. Therefore, even citing the IIGEP as precedence is contradictory to the road map which Justice Wigneswaran should be representing albeit his good intentions. In order to get a clear understanding of the international politics associated with the UNHRC discourse, one should start revisiting the draft resolutions, which were tabled in May 2009 by the West (Switzerland) and the China-backed Sri Lanka resolution in May 2009. “Glaring hypocrisy, blatant sophistry,” was the words of Francis Boyle, an expert in international law and a professor at University of Illinois College of Law, who was commenting on the Swiss draft. Professor Boyle had single-handedly won two World Court Orders in favour of the Republic of Bosnia and Herzegovina against Yugoslavia to desist from committing all acts of genocide against the Bosnians. He was particularly condemning the 12th operative paragraph of the Swiss resolution. It was as if the U.N. Human Rights Council had “invited the Nazi government to investigate and prosecute itself for genocide, crimes against humanity and war crimes against the Jews instead of supporting the Nuremberg Charter and Tribunal,” Boyle observed. He further observed: “This Resolution simultaneously gives the imprimatur of the U.N. Human Rights Council to the ethnic cleansing, genocide, crimes against humanity and war crimes that the Government of Sri Lanka has already inflicted upon the Tamils in the past, as well as the Council's proverbial 'green light' for the GOSL to perpetrate and escalate more of the same international crimes against the Tamils in the future." After comparing the two draft resolutions, one should also be revisiting the article, which appeared in SAIS Review of International Affairs [29(2), 39-49. Johns Hopkins University Press]. The piece was authored by Matthew Russel Lee, a lawyer and online journalist of the Inner City Press, who has covered the United Nations since 2005. After travelling with Ban Ki-moon to the island, he wrote: “Sri Lanka’s bloodbath on the beach made the UN’s Ban Ki-mute Moot”. 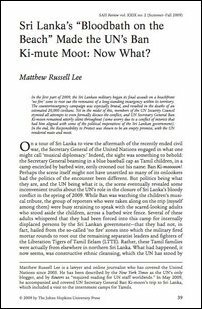 “In the aftermath of the carnage, in late-May of 2009, I traveled with Ban Ki-moon’s entourage to Sri Lanka’s devastated North, flying with the Secretary General over the blasted ‘no fire’ zone and later lunching with him at the Sri Lankan air force base from which the bombing sorties left,” Russell Lee wrote in 2009. “Make no mistake: this story is first about Sri Lanka. The country’s recent history, its political crises, ethnic divisions, and relationships with regional power players all provide the context for the explosive showdown that erupted in the first part of 2009. Yet, while this story is first about Sri Lanka, it is not only about Sri Lanka. It is also a story about the UN, telling us what happens when rising and declining powers clash, when power struggles emerge not only between China and the United States, but also between China and India, and more broadly, between the developing world and the West (the latter being represented, as is often the case, by western NGOs),” Russell Lee observes in his article. Particularly after September 2009, the pressure started to mount on the UN system. It was then the Journalists for Democracy in Sri Lanka (JDS) released a video-clip, which later set the trend for the series of documentaries by the British Channel 4. Even though the pressure was mounting on the UN system, the paradigm of the West (as articulated in the 12th operative paragraph of the Swiss draft) didn't change. The approach only saw a high degree of sophistication throughout the discourse. After ten years, the outlook still remains the same 12th operative paragraph of the Swiss draft in 2009. The Geneva discourse is defensively conceived on the part of the UN system itself. It wants to indirectly justify the way the UN acted during the genocidal onslaught in Vanni. This is the way the UN system wants to equate the two parties to the war in the island (GoSL and the LTTE) in the crimes. Furthermore, the question of genocide, according to the chosen approach, should not be taken up as it would be disqualifying the paradigm itself. The influencing State actors, particularly the geopolitical powers were regularly and actively influencing every milestone in the roadmap to ensure their strategic access to the island. Ensuring righteousness (moral and legal justice) is not the real motive of the UNHRC discourse witnessed in Geneva so far. As far as the influencing member states are concerned, the ‘transitional justice’ is also not intended to address the ethnic conflict in the island. In reality, it is aimed at regime-changes in Colombo. A more in-depth analysis would reveal that the discourse is also rooted in the assumption that Tamils' claim of external right to self-determination should be invalidated. Those demanding international investigations on genocide should be focused on asking questions, keep the Tamil masses focused on the failure of the UN system and retain their moral strength to improve the global system of humanity. It is under these circumstances, the alternative discourse of the PPT tribunal from Dublin to Bremen gains significance. The UN Human Rights Council gets influenced through bandwagoning. At the same time, the UN System itself is manipulated through the installation of personalities who should adhere to the design of powerful state actors. The OISL Investigation was also ‘managed’ this way. Even the three independent experts appointed by the High Commissioner (Martti Ahtisaari, Ms Silvia Cartwright and the late Ms Asma Jahangir) had an advisory role only, and they were not part of the decision making. The High Commissioner noted the views expressed by many stakeholders in Sri Lanka, including prominent community leaders, that the attention paid by the Human Rights Council to issues of accountability and reconciliation in Sri Lanka had helped to create space for debate, and catalyzed positive steps forward, however limited at this stage. The High Commissioner encourages the Council to continue its engagement and build on this momentum. In this regard, she reaffirms her long-standing call for an independent and credible international investigation into alleged violations of international human rights and humanitarian law, which could also monitor any domestic accountability process. However, Ms Pillay was excluding the allegation of genocide as she was also a follower of the architect of the paradigm (her predecessor). In August 2013, while visiting the island, she went to the extent of falsely claiming that “no-one uttered the word genocide” to her during her visit to the island. Ms Pillay was of the view that the pressure exerted by the UN rights regime was creating ‘space for debate, and catalyzed positive steps forward’ and she was merely reaffirming the call for an independent and credible international investigation to strengthen the pressure on the SL State even further. One needs to read in between the lines to understand her recommendation in this context. The politicians and legal activists among the Eezham Tamils would be deceiving themselves and their people by trading upon the confusing phraseology which originates from the ‘transitional justice’ roadmap which is intended to be slippery. 13.03.19 Tamil parties failing to single-mindedly demand genocide jus..
19.09.15 Welcoming OISL implies dropping national question and genoci..
28.05.09 Unprincipled, shameless, "Orwellian" UN resolution ever - Pr..
26.05.09 “Glaring hypocrisy, blatant sophistry” Boyle slams Swiss UN ..
SAIS Review of International Affairs: Sri Lanka’s “Bloodbath on the Beach” Made the UN’s Ban Ki-mute Moot: Now What?